MamaBreak: Coohpons.com Will Save you MONEY!!!! 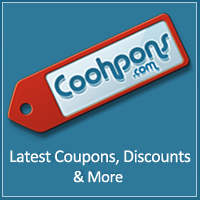 Are you looking for the best coupons on the web? We are loving Coohpons.com! They have coupons, online discounts, and more. We love all of the great companies they have codes for, such as 6pm. Mamas-- you know we LOVE 6pm for all of our kids' shoes, our shoes, and handbags (of course)! You do NOT want to miss this new coupon site! If you love deals websites, but get confused and overwhelmed by many of the systems, then this site is for you!!! With the best deals right up front, easy navigation, and a fantastic search function-- coohpons.com is easy to use, user friendly, and is sure to save you tons of money! Do not purchase anything online until you have checked for a code first! MamaBreak received compensation for this post. We only recommend products and/ or companies that we believe our readers will love! As always, our experiences and opinions are our own!